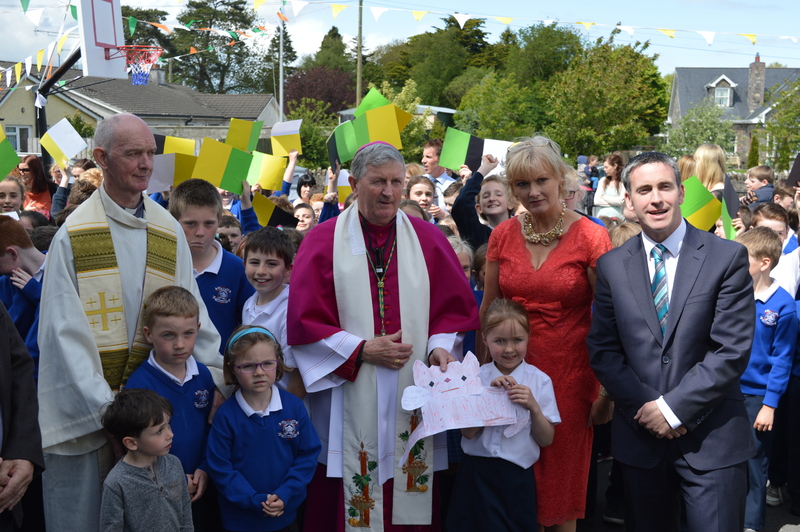 Opening of new St. Ultan’s N.S. Bohermeen extension – DAMIEN ENGLISH T.D. Minister for Housing and Urban Development – Meath West Fine Gael T.D. Thursday 28th May was a proud day for the Parish of Bohermeen and especially for pupils, parents and staff of St. Ultan’s National School. It was great as a former student of St. Ultan’s to return to join Bishop of Meath Michael Smith in the official blessing and opening of a new €308,000 extension to the school. Schools are at the centre of community life in Ireland, but especially in rural parishes like Boheermeen. They are where friendships are made and values are taught that set people up for life. That was certainly my experience of St. Ultan’s. There is a great team of staff here, both great teachers and great support staff. Pupils have the benefit of the best people possible here in St. Ultan’s. But pupils, parents and staff deserve the best possible buildings too. That is what we are celebrating and acknowledging here today in Bohermeen. 4 years of my time in this school were spent in prefabs. They were too hot in Summer and too cold in Winter. I am glad that prefabs are on the way out, and that is my vision for all our schools. The 218 pupil school has also been approved a further teaching post from September 2015 for the next school year.